The foundation will match gifts proportionally, up to 50%, from a pool of $100,000. Together, Match Madness donations, bonus prizes and matching funds combine for a total impact of $372,275.45 for the Salina community.SALINA, KS.— The Greater Salina Community Foundation hosted Salina’s 7th annual Match Madness giving day on Thursday, March 15, at Salina Fieldhouse. In 24 hours, over $270,000 was raised for 75 area nonprofit organizations through donations and bonus prizes. A total of 744 unique donors contributed a record-breaking total of $267,755.45 through 1,815 gifts. This is the highest total dollar amount and number of gifts raised in the event’s history. The foundation awarded $3,020 in bonus prizes to 56 organizations who participated in the nonprofit free throw contest. Each representative was given one minute to shoot 10 free throws, and every shot made was worth a $10 bonus grant. Three shooters made a perfect 10 out of 10, earning $100 for each organization they represented. They were Tim Niles of the Salina Saints, representing Catholic Charities of Northern Kansas; Marquez Patterson of the Salina Saints, representing Rolling Hills Zoo; and Bay’lee Purdy, Assistant Women's Basketball Coach at Kansas Wesleyan University, representing Salina Breakfast AMBUCS. Following the event, three $500 bonus grants were awarded to participating nonprofits. Sacred Heart Jr./Sr. High School was named “Most Valuable Player,” awarded to the nonprofit who raised the most dollars. Saint Francis Community Services was awarded “Most Improved,” awarded to the organization who received a higher number of gifts this year than in 2017. Child Care Aware of Kansas received “Most Spirited,” awarded to the organization who did the most marketing and promotion prior to Match Madness. The foundation will match gifts proportionally, up to 50%, from a pool of $100,000. 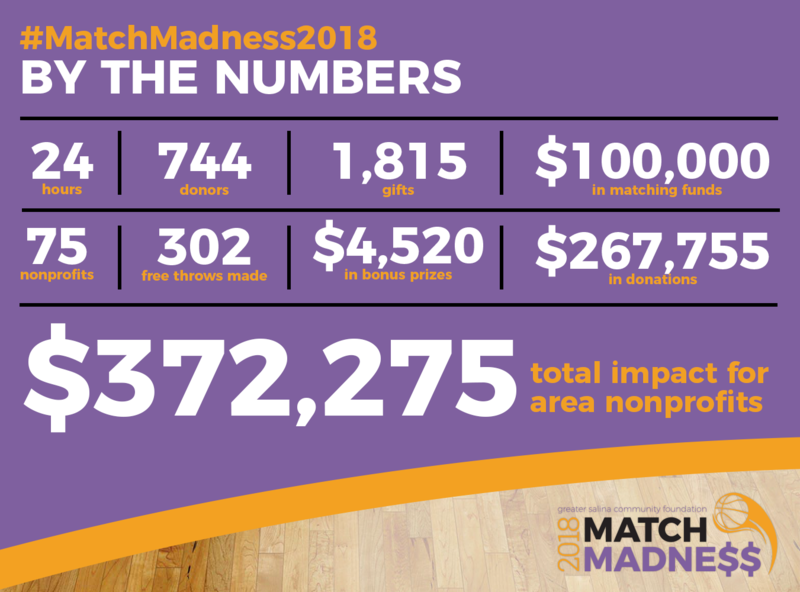 Together, Match Madness donations, bonus prizes and matching funds combine for a total impact of $372,275.45 for the Salina community.